What will you recommend for learning Japanese grammar? What is a good resource for learning Japanese grammar? I noticed. 24 minutes. tsk tsk tsk. I still arrived 2 minutes after you though. Genki is a good choice, probably the most popular. How far have you gone in studying Japanese? I would recommend taking J-CAT first (https://community.wanikani.com/t/Post-your-J-Cat-score/16427); or at least http://www.mlcjapanese.co.jp/Level_Check.html, for accurately estimating your Japanese knowledge. I’ve started with Genki and Tae Kim, and later bought Practice Makes Perfect’s “Complete Japanese Grammar.” The first two are really popular, the last one, not so much, but still fairly good - and all three were helpful in their own way. 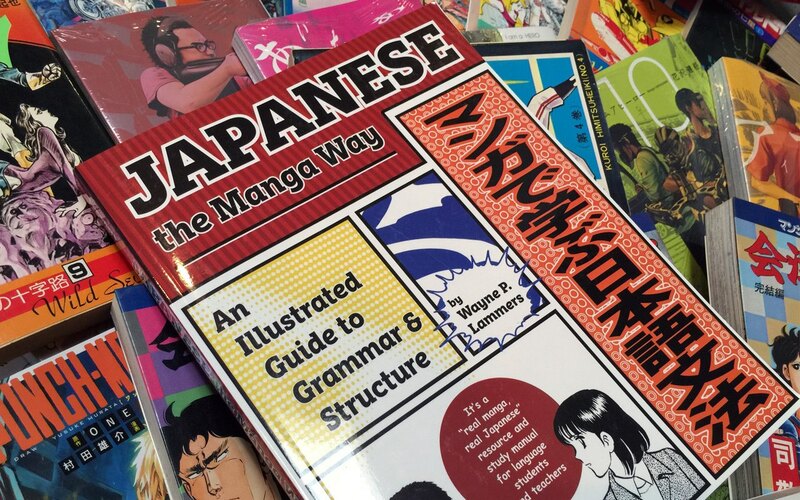 Japanese the Manga Way, by Wayne P. Lammers, is a textbook that does just what the title says: Teaches you Japanese with Manga. We reviewed it, and here's what we though. @rmizuno I’ve had that on my wish list for a while, but I’m concerned about the use of romaji. Was that part annoying? The Genki books are the best to get you started in my opinion. There’s also the Tae Kim guide but that’s a reference book, DO NOT use it as a textbook. For me, I’d say the opposite. I found Genki to be very dry and difficult for me to use solely for self study. I’m sure it’s great in a classroom setting, but I had trouble trying to use it to learn when I was being exposed to the material for the first time. I use TextFugu for grammar and use my Genki book only as a reference or for a second look at whatever I’m learning at the time. I didn’t really like Tae Kim’s guide, personally, so I didn’t use it but lots of people here recommend it. This is good advice… choose a resource that allows you to PRACTICE, PRACTICE, PRACTICE. Tae Kim is OK, but does none of that and is therefore a highly overrated and poor choice. I cannot understand why so many people recommend it in this context. Genki has lots of exercises, plus a workbook and is therefore a decent choice. Some of it is suited to a classroom environment, but a large amount of it can be completed solo. Eventually you’ll want to find a study partner, but you can get pretty far on your own. Oh yeah the fact that they’re classroom oriented also threw me off at first, but I’m the kind of guy who tends to ignore the excercises so I didn’t care much about it, but yeah it can be bothersome. What I didn’t like about TextFugu is that it’s way too basic, I mean it’s good but it doesn’t teach you much. I just saw someone mentioned Japanese The Manga Way, I actually used that years ago before doing Genki, it was really fun and I think it was actually made specifically for self studying? Maybe try that out if Genki isn’t really for you. You can ignore the exercises, but you’ll need some way to practice what you’ve learned. I know plenty of people who are fluent that never cracked a text book - they found people and just started talking. If you are not the textbook exercise type, listen to Textfugu’s latest podcast, “Why You Should Go To Japan Instead of Taking a Japanese Class,” it is really great. If you are not the shy type, start booking your trip! In the over 20 times I’ve been to Japan, I wish I followed this advice, I really squandered the experiences! I’m a third world 19 years old student, man, I can’t just “book a trip” to Japan, but I appreciate the sentiment lol. My practice comes from reading native material most of the time, maybe once I get better I’ll join some japanese class only for the speaking practice. I live in Japan, but I the reason I’m here is because of the JET Program… I can’t imagine buying tickets to Japan round trip 20 times. That would cost like $60,000 in coach class, haha. Never mind all the other travel expenses.